Quite often when we are shrouded in the clouds of darkness we feel that there is no ray of hope/light. Much to the contrary, light is always surrounding even the darkness and is only finding one small opening to pierce through the dense darkness. There cannot be darkness without light and hence light is always around us. 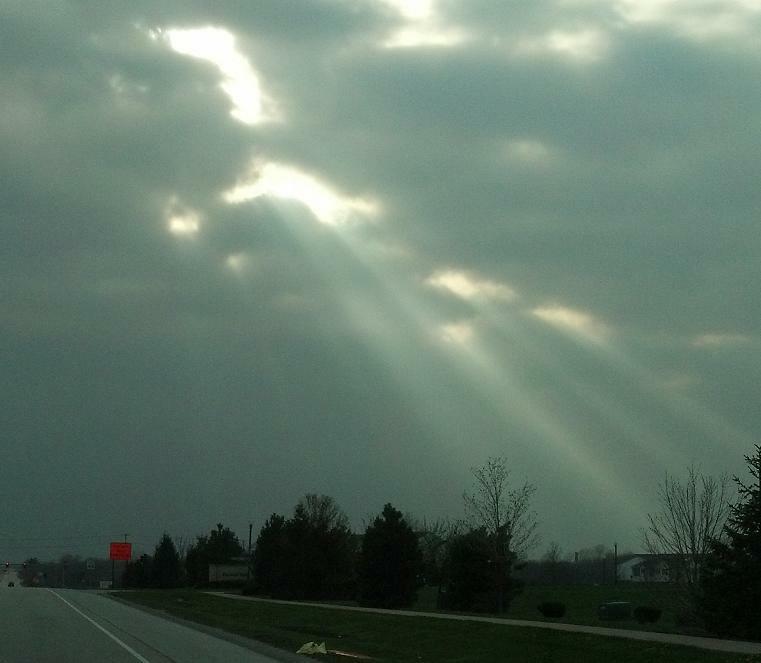 Our ray of hope could be a person, situation, higher power, nature, love or a simple word of encouragement we receive. The key here is having that ‘opening’ or creating one to receive and make space for the light to enter. This is a choice we ought to make as humans. I am beginning this blog with a confession for a change.Here it goes.. I spend a lot of my time denying my humanly flaws and limitations. Somewhere I nurture a belief that I am superior to others or better than others in some ways. Where I learned that from? Well, I will give myself credit for some personal work I did through self reflection and seeking feedback from people whom I placed at a pedestal. For the most part of my life ( just so you know..I am not 50 years old) I have also been what many people understand as a ‘spiritual seeker’. During my associations with several spiritual organizations and teachers I believed that I was being ‘good’ and doing ‘good’ by being of service to people in different ways. I was almost convinced that I did not have much stuff to process and that I was just a few meditations away from having a ‘halo’ around my head ( I smile as I write this). My life was hunky dory until some relationships mirrored my stuff to me i.e. rigidity, ‘I am right and you are not’, extend your wisdom only when asked. My intention in writing this here is to say that today I am willing to acknowledge my own ‘shadows’ or ‘ego issues’. I have often found myself irritated and frustrated when I have projected my issues onto other people which in itself has been a learning process. Phew! An example of a epiphany would be that I may be available to help another person in some kind of distress with insights/tools/experiences/ways to better themselves etc etc..but every individual has a choice to not accept my offering at that point. Also, I may not necessarily be everyone’s ‘teacher’ ( there’s that dreaded word). I have had to learn to hold back and offer myself only when asked. Believe me, it’s a very hard lesson. Why am I writing all of this? Today while I was in the gym, I stumbled upon the idea of relating the process of washing clothes in a washing machine / manually to our internal cleansing process if you will. Bear with me as I describe this mundane process: we take our dirty laundry, insert in a machine, choose the spin cycle depending on how dirty the clothes are or the nature of the fabric, add detergent and let the cleaning begin. The inherent assumption here is that we recognize we have some dirty laundry. If we refuse to see it (and I have lived with some roommates who stunk the rooms with their laundry…digressed, ok), it keeps piling up and the stench grows. Assuming we are fairly reasonable people, we take our laundry and begin the process of cleaning. Our detergent is our external cleaning agent to intensify the process and our helpers are the adjustments in the cycles. My aha moment happened when I thought…there is a point in the cleaning process when the dirt coexists with the cleaning. These are simultaneous occurrences and over a period of time and effort, the dirt gets washed off. Beep, beep!!! In my personal life, I have found relationships to be instrumental in highlighting my dirty laundry. It does take a couple of blows in different intensities to identify and acknowledge – ‘my bad’, ‘ I am wrong’ and the likes. I know it in my body when I am trying to deny something that has come up for me. I become defensive, feel tight in my shoulders and breathe shallow. Some individuals tend to use guilt and shame towards themselves to which I can say today ‘hey..whatever works for you’. However I love myself too much to put myself through that ‘spin’ and I tend to choose a gentle cycle. Interestingly enough, I am now fairly comfortable acknowledging my flaws and find it easier to relax knowing that ‘both are needed’ i.e. the dark and the light (I thought of the Chinese yin-yang symbol while writing this).As I work on my strengths and increase my capacity to be aware of my limitations, I need to sit with some level of discomfort on a daily basis. I can also say that ‘this is just a part of being human’. As I accept myself better, it will also reflect in the nature of my relationships. As is said in some schools of thought, once your awareness has increased, you cannot be the same person as you were. Our external cleaning agents which we can use could be journaling, meditation, talking to a friend, personal coaching and just being open to that inner voice that exists in all of us. Isn’t it much easier to be in the flow..instead of holding on to dirt and adding unwanted weight!So..what do you need to clean up? Hahaha.